Mohammadi Khoshraj, B., Seyyed Najafi, F., Mohammadi Khoshraj, J., Ranjbar, H. (2018). Microencapsulation of Butyl Palmitate in Polystyrene-co-Methyl Methacrylate Shell for Thermal Energy Storage Application. Iranian Journal of Chemistry and Chemical Engineering (IJCCE), 37(3), 187-194. Behrouz Mohammadi Khoshraj; Fardin Seyyed Najafi; Jalal Mohammadi Khoshraj; Heydar Ranjbar. "Microencapsulation of Butyl Palmitate in Polystyrene-co-Methyl Methacrylate Shell for Thermal Energy Storage Application". 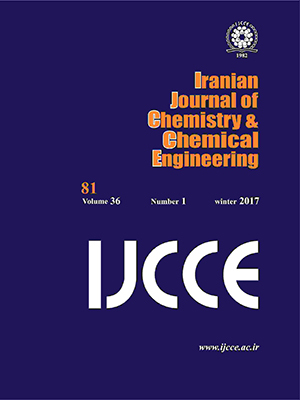 Iranian Journal of Chemistry and Chemical Engineering (IJCCE), 37, 3, 2018, 187-194. Mohammadi Khoshraj, B., Seyyed Najafi, F., Mohammadi Khoshraj, J., Ranjbar, H. (2018). 'Microencapsulation of Butyl Palmitate in Polystyrene-co-Methyl Methacrylate Shell for Thermal Energy Storage Application', Iranian Journal of Chemistry and Chemical Engineering (IJCCE), 37(3), pp. 187-194. Mohammadi Khoshraj, B., Seyyed Najafi, F., Mohammadi Khoshraj, J., Ranjbar, H. Microencapsulation of Butyl Palmitate in Polystyrene-co-Methyl Methacrylate Shell for Thermal Energy Storage Application. Iranian Journal of Chemistry and Chemical Engineering (IJCCE), 2018; 37(3): 187-194. MicroEncapsulated Phase Change Materials (MEPCM) are green materials which could be used for thermal energy saving applications in buildings as a non-pollutant method for environmental. PCMs could passively reduce peak cooling loads in hot seasons because of their high energy storage capacities at a constant temperature. Purpose of this paper is manufacturing Microencapsulated PCM (MPCM) products for use in gypsum wall applications, with the aim of expanding in use from butyl palmitate in polystyrene-co-methyl methacrylate shells. This type of microencapsules synthesis had not been previously described in the literature, nor patented. PCM (butyl palmitate) can be encapsulated by these processes and in the form of core-shell structure with use of different stirring rates and hybridized suspension agents. SEM micrographs of microencapsulated MPCMs show that spherical microcapsules were obtained with a narrow PSD (0-150 μm) with a stirring rate of 800 rpm and hybridized suspension agent (TCP). About, 65 % (wt.) of MPCMs was butyl palmitate with 70.6 J/g of latent heat energy which indicates the applicability of this synthesis MPCMs for thermal energy storage in gypsum walls. Our synthesis results on the basis of suspension like polymerization process show good encapsulation efficiency with proper thermal energy storage capacity in gypsum walls. Dwivedi V.K., Tiwari P., Tiwari S., “Importance of Phase Change Material (PCM) in Solar Thermal Applications: A Review”, Proceedings of the International Conference on Emerging Trends in Electrical, Electronics and Sustainable Energy Systems (ICETEESES), Sultanpur, India, 11–12 March (2016). Mehling H., Cabeza F., “Heat and Cold Storage with PCM”, Springer-Verlag Berlin Heidelberg (2008). Gkanas E.I., Grant D.M., Kzhouz M., Stuart A.D., Manickam K., Walker G.S., Efficient Hydrogen Storage in up-Scale Metal Hydride Tanks as Possible Metal Hydride Compression Agents Equipped with Aluminum Extended Surfaces, Int. J. Hydrog. Energy, 41: 10795–10810 (2016). Souayfane F., Fardoun F., Biwole P., Phase Change Materials (PCM) for Cooling Applications in Buildings: A Review, Energy Build., 129: 396–431 (2016). Thambidurai M., Panchabikesan K., Mohan K.N., Ramalingam V., Review on Phase Change Material Based Free Cooling of Buildings—The Way Toward Sustainability, J. Energy Storage, 4: 74–88 (2015). Kosny J., PCM-Enhanced Building Components— An Application of Phase Change Materials in Building Envelopes and Internal Structures; Springer International Publishing: Steinhausen, Switzerland, (2015). Graci, A.D., Cabeza L.F., Phase Change Materials and Thermal Energy Storage for Buildings, Energy Build., 103: 414–419 (2015). Lin W., Ma Z., Cooper P., Sohel M.I., Yang L., Thermal Performance Investigation and Optimization of Buildings with Integrated Phase Change Materials and Solar Photovoltaic Thermal Collectors, Energy Build., 116: 562–573 (2015). Zhou D., Zhao C.Y., Tian Y., Review on Thermal Energy Storage with Phase Change Materials (PCMs) in Building Applications, Appl. Energy, 92: 593-605 (2012). Dubey R., Shami T.C., Bhasker R., Microencapsulation Technology and Applications. Defence Science Journal, 59(1): 82-95 (2009). Sanchez L., Sanchez V., Lucas A., Carmona M., Rodriguez J.F., Microencapsulation of PCMs with a Polystyrene Shell, Colloid Polym. Sci., 285: 1377-1385 (2007). Sanchez L., Sanchez V., Lucas A., Carmona M., Rodriguez J.F., Influence of Operation Conditions on the Microencapsulation of PCMs by Means of Suspension-Like Polymerization, Colloid Polym. Sci., 286 (8-9): 1019-1027 (2008). Sanchez L., Rodriguez J. F., Romero A., Borreguero A.M., Carmona M., Sanchez P., Microencapsulation of PCMs with a Styrene-Methyl Methacrylate Copolymer Shell by Suspension-Like Polymerization, Chem. Eng. J., 157: 216–222 (2010). You M., Wang X., Zhang X., Zhang L., Wang J., Microencapsulated n-Octadecane with Styrene-Divinybenzene co-Polymer Shells, J. Polym. Res., 18: 49-58 (2010). Sanchez L., Tsavalas J., Sundberg D., Sanchez P., Rodriguez J.F., Synthesis and Characterization of Paraffin Wax Microcapsules with Acrylic Based Polymer Shells, Ind. Eng. Chem. Res., 49: 12204-12211 (2010). Sanchez L., Carmona M., De lucas A., Sanchez P., Rodriguez J.F., Scale-up of a Suspension-like Polymerization Process for the Microencapsulation of Phase Change Materials, J. Microencapsulation, 27(7): 583-593 (2010). Sanchez P., Sanchez-Fernandez M. V., Romero A., Rodriguez J.F., Sanchez-Silva L., Development of Thermo-Regulating Textiles Using Paraffin Wax Microcapsules, Thermochim Acta, 498: 16-21 (2010). Sanchez L., Lacasa E., Carmona M., De lucas A., Rodriguez J.F., Sanchez P., Applying an Experimental Design to Improve the Characteristics of Microencapsules Containing Phase Change Materials for Fabric Uses, Ind. Eng. Chem. Res., 47: 9783-9790 (2008). Ma Y., Sun S., Li J., Tang G., Preparation and Thermal Reliabilities of Microencapsulated Phase Change Materials with Binary Cores and Acrylate-Based Polymer Shells, Thermochimica Acta, 588: 38-46 (2014).